Vend is retail POS software, inventory management, ecommerce and customer loyalty for iPad, Mac and PC. Easily manage and grow your business in the cloud. Vinsight integrates with Vend enabling you to track and analyse your Vend data within Vinsight. Vend orders automatically generate a Sales Order in Vinsight and automatically deplete Vinsight inventory. Go to Add-ons in the Settings > Setup area. 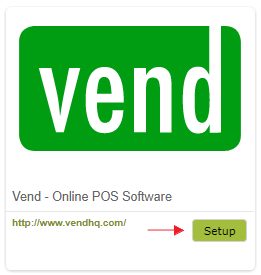 Click the ‘Setup’ Button next to the Vend logo. If you operate more than one division, select the division you wish to connect to Vend. You can have one Vend connection per Division in your Organisation. Select the time zone that you want scheduled jobs to run in. This should be your own time zone. Click ‘Connect to vend’. This will take you to the Vend sign in page. Sign in to your Vend account. 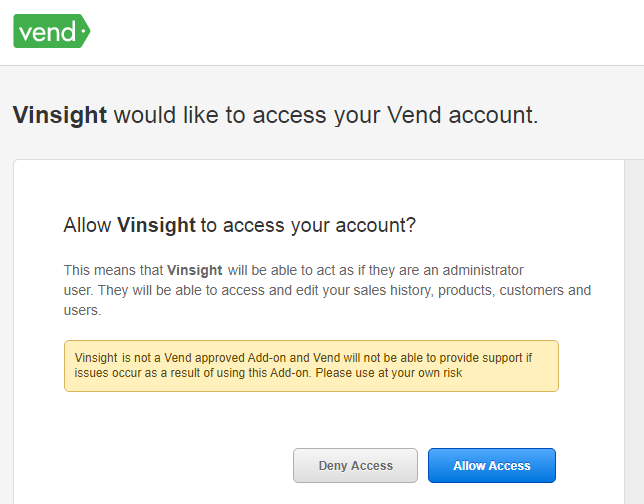 You will need to authorise your Vinsight account to access your Vend account by clicking ‘Allow Access’. You will then be directed back to the Vinsight – Vend configuration page. 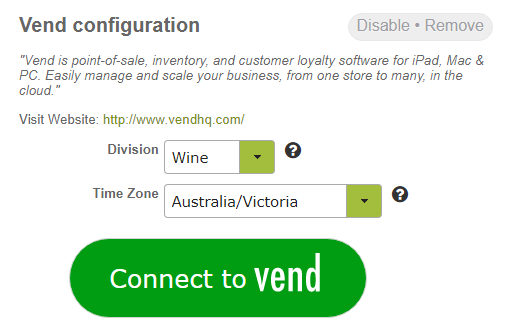 Select the Stock Location that Vinsight will draw down inventory from when Vend orders are fulfilled from the drop down list provided. If you don’t want orders despatched automatically, simply leave this field blank. Select how you wish your different Vend payment methods to be dealt with in Vinsight. The payment methods you have set up in Vend will appear in the drop down list provided. Real-time order replication: Orders that fall into this category will be processed in real time. You will get a single order in Vinsight for every order made in Vend. Delayed, aggregated order replication: Orders that fall into this category will be processed once per day (at midnight). You will get a single order in Vinsight per day for each payment type. For example, with the following set up, every credit card order will create a separate sales order in Vinsight, whereas the cash orders will be aggegrated into one Vinsight sales order for each day. 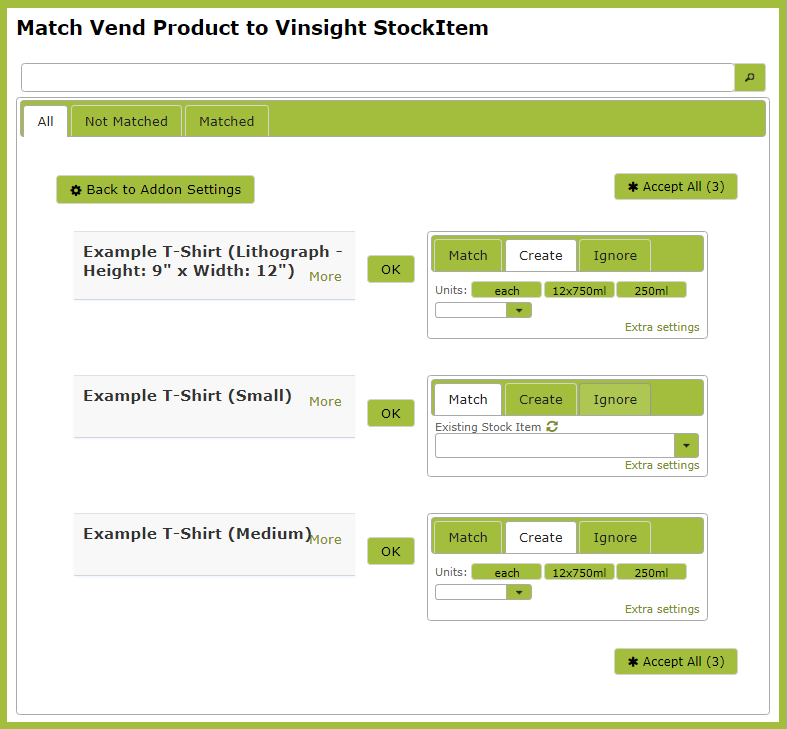 Next you need to ‘Match’ your Vinsight stock items to those in Vend. Click the ‘Match Stock Items’ button. This will take you to a list that shows your Vend Stock Items on the left and potential Vinsight Stock Item Matches on the right. To Match to a Vinsight stock item click on the ‘Match’ tab and select the Vinsight Stock Item from the drop down list, then click ‘OK’. If a matching Vinsight Stock Item does not yet exist click the ‘Create’ tab, select the Unit of Measure from the options provided (or select a new unit of measure by clicking ‘Extra settings’) and create a new Vinsight Stock Item from this page. 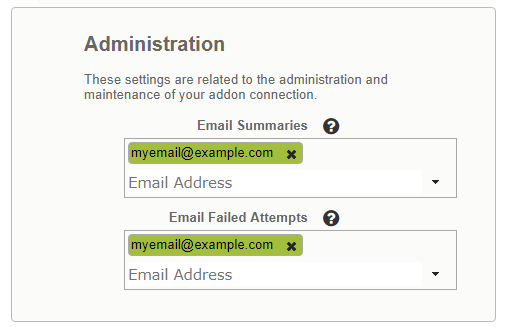 Finally ensure that you have the correct email addresses set up in the Administration section. Email Summaries: Daily summaries will be emailed to the addresses provided here, giving an overview of orders that have been synced from Vend to Vinsight. Email Failed Attempts: Any errors that occur during the operation of this add-on will be emailed to any addresses listed here. Once your Stock Items have been matched, and emails confirmed, set up is complete. Your ‘Vend’ sales will now be included in your Vinsight reporting and inventory tracking.